The Rebel Sweetheart. 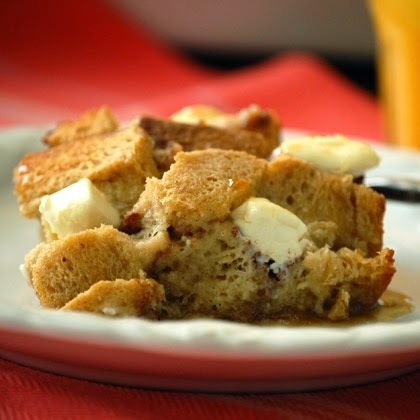 : Foodie Goodie | French Toast with a Twist. Nothing says weekend like a big hearty brunch of French toast, fried eggs, and a tall glass of orange juice (or a cup of coffee for coffeeholics like me). Now if you're planning on making French toast for tomorrow's breakfast (or brunch), here's a different take to the usual pan-toasted soggy bread. 1. In a medium saucepan, melt together butter, brown sugar, corn syrup and cinnamon. 2. Cook until sugar is dissolved. 3.Pour in a 9 x 13 inch baking pan. 4. Remove bread crusts and cut into large cubes. Place bread on top of brown sugar mixture in the pan. Top with cubes of cream cheese. 5. In a large bowl, whisk together the eggs, milk, vanilla and nutmeg. 6. Pour the mixture over bread. Cover and refrigerate overnight. 7. Bake uncovered at 350 degrees for 45 minutes. Serve with maple syrup, fresh fruits or bacon and eggs. Mmm this sounds good! French toast is one of my staples but it does feel repetitive after a while. I'll have to try your spin on it sometime. I have a similar recipe that uses cream cheese for an overnight french toast casserole. Yours sounds simply divine! With a fresh fruit salad, this makes a great breakfast for supper dinner too! Looks good! I've never had French Toast before so thanks for sharing! awesome! never baked French toast or have it with cream cheese. I will try this over the weekend then. I am happy to have stopped by! Sounds like a hit for Saturday morning breakfast. I just scanned the ingredients and I know for sure it is yummy! I LOVE french toast! I'll definitely need to try this! This post is making me soooooooo hungry. I'm still on detox. I'm making this when detox is over! I'll have a French Toast feast with the kids hahahaha. We also add cinnamon in our french toast. Family loves to eat this especially during breakfast time! would love to try something similar! that toast looks inviting!